Looking for affordable, high-quality high index lenses? 1.67 high index is the most affordable high index lens material as well as the high index lens material that offers the most color and prescription type options. If you’re looking for a pair of prescription high index glasses with the highest customization, this is the lens material for you. 1.67 high index comes in clear, Transitions, and tinted lens colors, with single vision, lined bifocal, and progressive bifocal prescription types. You can order 1.67 high index in a variety of frame types and with virtually any type of prescription. 1.67 high index is the most affordable high index plastic lens material; the others are all more expensive. 1.67 high index lenses are available in clear, Transitions Gray, Transitions Brown, gray tinted, and brown tinted colors. 1.67 high index comes in single vision, flat-top (lined) bifocal, and progressive lens types. 1.67 high index lenses are available with scratch coating, anti-reflective coating, and UV protection coating. 1.67 high index lenses are thinner, lighter, and more scratch resistant than standard plastic lenses, though the higher index lenses accomplish all of these things to a greater extent. 1.67 high index lenses are a great choice for those who are new to high index lenses and don’t have extremely high prescriptions. 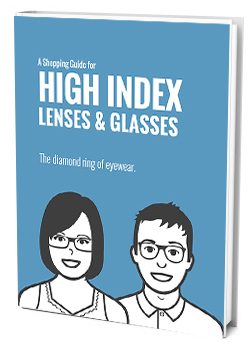 If you are getting your first pair of high index lenses, consider getting 1.67 high index. They are great introductory high index lenses, they are affordable, and they give you a sample of all of the benefits that high index lenses can give you. If you have an extremely high prescription or want the thinnest, lightest lenses possible, you may want to consider a higher index lens material. If you’re interested in finding more information about the different high index lens materials or what is best for you, leave a comment below or check out some of our other posts. Thanks for reading, and happy shopping!